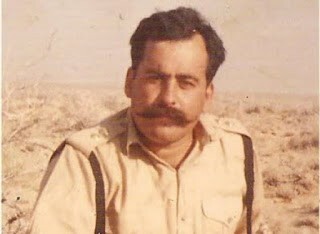 About the Author: Agha H. Amin , Retired Tank corps major. His writings were published in Pakistan Armys prime journals , Pakistan Army Journal and Citadel Journal of Command and Staff College Quetta. Wrote The Essential Clausewitz in 1993, Sepoy Rebellion of 1857-59 in 1998 , Pakistan Army till 1965 in 1999 ,Development of Taliban Factions in Afghanistan and Pakistan (2010) ,Taliban War in Afghanistan (2009). Served as Assistant Editor of Defence Journal ,Executive Editor of globe and Founder Editor of Journal of Afghanistan Studies . An associate of the think tanks ORBAT and Alexandrian Defense group. Carried out various oil and gas and power transmission line surveys in West Asia. Editor in Chief of monthly Intelligence Review and monthly Military and Security Review. Heads the think tank Centre for study of Intelligence Operations established in early 2010. The sepoy war of 1857 gave birth to a new theory in India. This theory was floated in the late nineteenth century: that the races living in the north west part of India i.e. 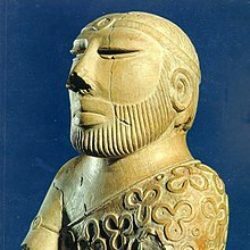 present northern regions of Pakistan and parts of Indian Punjab were the “Martial Races of India”! This theory was partly (but as shown below, only partly) based on the “Punjab and Frontier” loyalty factor of 1857. 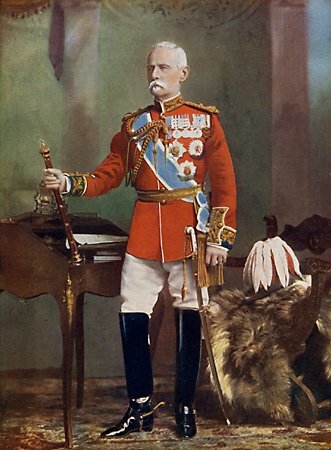 Its most serious proponent was Lord Roberts, the British C-in-C in India (563). When I joined the army in 1981 I observed that many of the officers and soldiers serving in Pakistan Army were convinced that the races or castes living in the area between Chenab and Indus Rivers were especially “martial”. Some Pathans originating from the NWFP were also regarded as junior partners of these martial races! 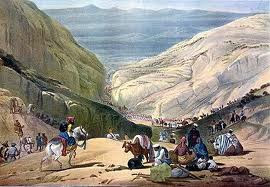 Most of the invasions of India took place originating from areas north of Khyber Pass or west of Quetta i.e. Persia etc. Then the Mughals after 1526 recruited from Hindu Rajputs, Muslim Pathans, Muslim Rajputs, some Muslim Punjabis and Muslim Baloch, but the preference was given to trans-Indus races, mostly Pathans or Persian speaking, or to Hindu Rajputs. The EEIC (English East India Company) since it made its entry from the east had no choice but to recruit from Oudh, parts of Bihar, North West Provinces Madras Bombay Central India etc. In the earlier part of this work we have seen that using a predominantly Hindu army recruited from the Gangetic plain and led by British officers, the pre-1857 Bengal Army defeated all races of India, Pakistan, Nepal, Afghanistan etc. A small contingent of the Bombay Army (made up mostly of Hindu Marhattas) quickly made Persia behave! A couple of Bengal Army Regiments reinforced by an odd European regiment successfully defended Kandahar and Jallalabad against vastly superior forces. But the rebellion of 1857 changed British perceptions about Indian people and keeping in view the political reliability as well as the administrative convenience factor the British decided to recruit mostly from the north west i.e. Punjab and Frontier provinces of India plus the Gurkhas from Nepal. This change started from 1857 but became significant only around 1895. But loyalty and reliability were not the only factors, because the Madras and Bombay Armies had also stayed loyal. Partly based on the personal biases of Lord Roberts, and under his influence of some other British senior officers, the recruitment policy was changed. Initially, following 1857 the British adopted the policy of non-reliance on any particular race and even the Punjabi Muslims and the Pathans who had remained loyal were mixed with other castes and religious communities, with only the Gurkhas and certain Muzhbi Sikh Regiments grouped together. An experiment of having pure Muslim or pure Hindu Rajput regiments was started from 1893 but abandoned by 1919, keeping in view the mutinies of 5th Light Infantry and 15 Lancers at Singapore /Mesopotamia. 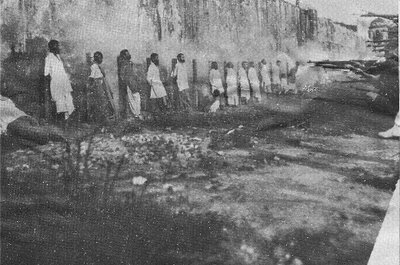 Singapore Mutineers being shot. The Ranghar Muslims of 5th Light Infantry were superior in stature to any Indian soldiers who were mercenaries of British. Among Pashtuns their greatness was matched by Wazirs, Mehsuds, Afridis and Alizais who rebelled against the British in First World War. In the 1880 and 1890s it was widely believed that the Indian army was supposed to face the Russian threat originating from Central Asia. It was thus said that the Bombay or Madras soldiers who were shorter in height and smaller in physique were not fit for mountain warfare in India’s north west (564). Charles Chenevix Trench an Indian Army British Officer and a respectable military historian has given a reason for the British bias against east of Jumna and South Indian races. He says in his book on the Indian Army that “Reasons for preferring northerners were largely racial. To Kipling’s contemporaries, the taller and fairer a native, the better man he was likely to be. He looked more impressive on parade, he might be physically stronger, he would surely be braver and more loyal than the down country men. There was a general preference for the wild over the half educated native as being less addicted to unwholesome political thinking”. Charles Chenevix Trench went further in explaining this British bias, he said “Brahmins had been prominent in the Mutiny, and their diet and prejudices though somewhat illogical by stating as following: “The Madrasi soldier was smallish, blackish and rather low caste. The Mahratta was also in origin of no very high caste, and smallish to hoot. The fact that his grandfather had held India to ransom did not make him more acceptable to the Indian Army ” (567). It must be noted that the first Afghan war was fought by a largely Hindu army. Whatever the initial British failures, the British won the First Afghan war, giving Afghanistan such a mauling that the Afghans dared not attack India in 1857 when the British were really highly vulnerable. It would be false and erroneous, however, to assume that the British immediately changed the class composition of the Indian Army (Bengal Army in particular) in the years following 1857. In this regard the British quality of patience and subtlety in terms of long-term thinking is admirable. They still continued recruitment from the areas around Delhi and east of Jumna; which had played a major role in the rebellion. The real shift and bias in British policy was a slower process; and had little connection with any war fought by a still largely Hindu majority and Hindustani heavy Bengal Army as evident in terms of 1885 statistics; in the period between 1880 and 1914. Further another major change took place in 1895. The three armies i.e. in Bengal Madras and Bombay armies were amalgamated. The percentage of ethnic Madrases and Mahrattas from Bombay was systematically reduced as a strict matter of policy(570). 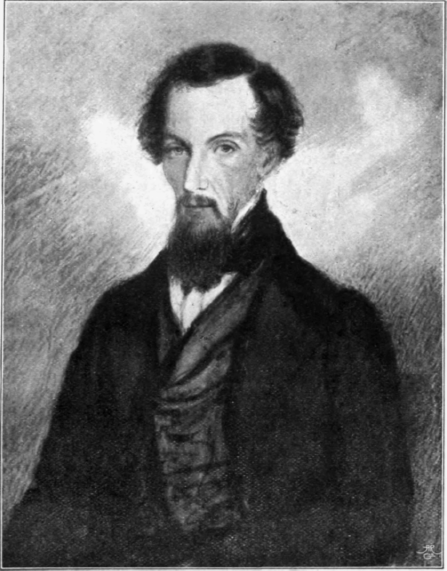 Henry Lawrence one of the eminent Lawrence Brothers made a very subtle remark in late 1840s. He said “Courage goes much by opinion; and many a man behaves as a hero or a coward, according as he considers he is expected to behave. Once two Roman Legions held Britain, now as many Britons might hold Italy” (571). 10. 2. 47.5 Squadrons-Partly Punjabi. Despite this preponderance, the non-Punjabi Hindu Gurkhas and Hindu Garhwalis did well in the Indian Army in WWI. e.g. theoretically at least the Punjabi Muslims who were the largest community in the fighting arms should have won the maximum number of VCs, but this did not happen. The intention behind the whole argument is to prove that bravery has little connection with race or religion. The theory of “Martial Races” influenced the post-1947 Pakistani Politics in a negative way. The new state was a federation composed of five nationalities. The army due to pre-1947 British policy was largely Punjabi. It was perceived by Sind, Baluchistan and East Pakistan largely as a Punjabi show in which the Pathans were junior partners. The army officers of that period were convinced that they were a martial race and the Hindus of the Indian Army were cowards. 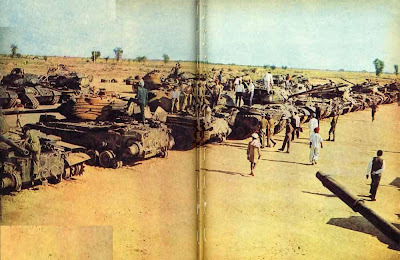 This myth was largely disproved in 1965 when despite having more sophisticated equipment, numerical preponderance in tanks and the element of surprise the Pakistan Armoured Division miserably failed at Khem Karn merely due to poor and irresolute leadership at the brigade and divisional level to a complete extent and even regimental level to a partial extent. Meanwhile the army employment in Baluchistan in 1950s made the Baluch think that little if any had changed since 1947. The officer from Potohar with limited grey matter perceived the Muslim Baloch as a foreigner as much as the British pre-1947 officer had thought. This was not the fault of the Punjabis as such, but the result of a British policy introduced during the period Usurping of power while leading the largely Punjabi based army by Ayub Khan increased the East-West divide. Things in Pakistani politics were then judged on ethnic lines. The on ground realities were different. Ayub was not a Punjabi but later in 1971 the Bengali Muslims blamed the Punjabis for all their maladies! In reality the Punjabis being leaderless were manipulated by both Ayub and Yahya! Bhutto who played a major role in persuading Yahya to launch the military action was a Sindhi! A complete tank regiment of Pakistan Army along with most of the officers was captured by the Indians at Khem Karan in 1965 1857-(1910). 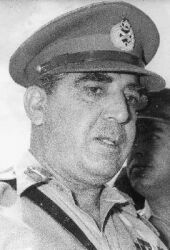 General Agha Mohammad Yahya Khan’s trigger happy use of excessive military force in 1971 precipitated a war which led to the creation of Bangladesh. 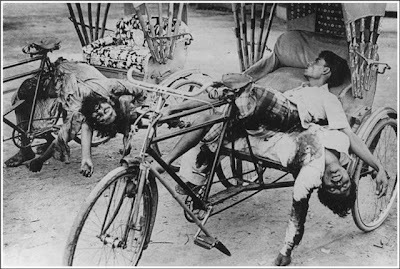 It appears that the Two Nation Theory had ceased to exist in the killing fields of East Bengal in 1971. But why was the army so actively participating in the genocide? The same Britishers who were so active in criticising the Pakistani atrocities in 1971 had as a matter of fact created this machine following 1857 based on antiquated and irrational ideas of Robert in the post-1880 period. The disease started in 1857 when the British reaped the harvest of the policy of divide and rule when they employed the Gurkha against Indian, and within India the Punjabi (whether Sikh or Muslim) against the Hindustani. The Gurkha against the Punjabi. The Jallianwalla massacre in which Gurkha troops fired on the public meeting comprising Punjabi civilians in 1919 was a good example of the fact that the British did not love the Punjabis, but were merely using them. The Punjabis started learning this from 1919 but by the time the awareness was growing the Britishers were already winding up. The most glaring example of the policy of selective recruitment was in the old NWFP region of pre- 1947 India. Here the British deployed one Pathan against another. Sometimes from the same tribe and sometimes from the other. Sometimes the Turi Shia(574) against the non-Shia Wazirs or Mahsuds or Afridis. The post-1947 rulers of Pakistan, instead of remedying a basically illogical recruitment policy which had no logical basis became its victim. Thus whenever army was used in a province other than Punjab it was perceived as “Punjab against Sindh” or “Punjab against Bengal” or “Punjab against Baluchistan”! The rulers were merely the instruments of a pre-1947 policy. The army outside Punjab was trigger happy because it was fighting in a foreign land. For short-term purposes this policy is viable but for how long? In the long-term it will only lead to creation of more Bangladeshes? The British divided us by their negative policies both in India and in Pakistan. In Pakistan the problem became more serious because the military usurpers were not interested in changing the recruiting policy. The same trend continues and it seems that little has been learnt from the 1971 tragedy. There are two unique shipwrecks lying at the bottom of the Bay of Bengal. One is the shipwreck of the “Martial Races Theory”, the other is the ship of the “Two Nation Theory”! Once Pakistan was created in 1947 an endeavour at the official level was made to advance and prove a theory that Hindus and Muslims were two nations ever since the first Muslim conqueror landed in India in 711 A.D. I feel that the creation of Pakistan as an independent Muslim state in 1947 was the result of a conscious realisation among the Muslims of Indo-Pak sub-continent mostly in the post-1937 period about the necessity for an independent Muslim state in India. Till 1857 as we have seen the Hindus who were the majority accepted the Muslim political ambitions at least in Northern India. The post-1857 period saw a deliberate British policy of divide and rule. This policy as we have seen not only pitched the Muslims against Hindus but created divisions even among the Muslims. The Hindustani Muslim versus Punjabi Muslim rift has very clear cut origins in the post-1857 British policy., Firstly they conquered the Punjab and Frontier with a predominantly Hindustani army comprising some 75% up Hindus and some 25% Hindustani Muslims. Subsequently when largely the Hindustanis turned against the British, they very cleverly manipulated a largely Punjabi based army against the treacherous Hindustanis. They established a negative precedent by using Punjabi Muslim Pathan and Sikh troops in Sind during the Hur uprising. In 1919 they used Gurkhas at Jallianwala to give the South of Chenab Punjabi Muslims, Sikhs and Hindus a taste of hot lead. Dyre’s action convinced the too pragmatic Punjabis about the gross futility of martyrdom! The British cannot be blamed since their prime interest and; rightly so was to preserve their empire! The “Two Nation Theory” was not in existence in 1857. Muslims fought loyally for the British at Delhi in 1857 against a largely Muslim city led by a Muslim King. More Hindu Bengal Army sepoys fought at Delhi for the Rebel cause than Hindu troops in the British force attacking Delhi. In 1846 and in 1849 a largely Hindu majority army was used to destroy the independent country of Sikhs. Even among Hindus there were sharp divisions like the Mahratta Bombay Army fighting against a largely Hindustani army led by a Marhatta, Tantia Topi. The Madras Hindu of the Madras Army fighting against the Hindustani or Purbeah Hindu infantry man of the Bengal Army in Central India. Theories cannot create nations or hold them together. Such theories are only the results of naive spinster-like imaginations of pedantic Indo-Pak professors teaching Indian history in Canadian or American universities! Today a ridiculous argument is presented to justify the partition by citing the figures of casualties during transfer of population. These historians forget that Russians who were all one race and belonged to one Christian sect killed some ten million Russians in the Russian Civil war (575) just because of the funny theory propounded by Karl Marx. Actually cleverly manipulated theories have divided nations regardless of religion more than uniting them. Thus, in the Spanish Civil War some 600,000 (576) Spaniards were killed merely because one Spaniard believed in the socialist theory while the other was an anti-Republican! The Two Nation Theory did not protect the Muslim Bengali from being slaughtered by the Muslim Punjabi or the Muslim Pathan. It did not help the Baloch in 1974-76. It did not keep peace in Sindh in 1986 or in 1992 or 1995 or even today. The problem of Pakistan is that there is too much theory and too little practice and little effort has been made to rid the country of the pre-1947 cynical British policies whose harm a prophetic philosopher like Karl Marx could see as early as 1857. The civil servant or soldier of today’s Pakistan behaves like a British ICS or like Brigadier Dyer of pre- 1947 era. Although qualitatively the standard of both civil and military officials is poorer than the British, many ways in which they perceive the populace are similar. The non-Bengali or non-Sindhi civil servant in Sindh or previously in pre-1971 East Pakistan viewed the local Sindhi or Bengali as a despicable native! In March 1971 the Dacca University massacre of the students was as vehemently approved in Punjab, as Dyers Jallianwalla Bagh massacre of 1919 in Britain! The North of Chenab Rangers inspector or soldier behaves just like the Sikh soldier or any other Punjab irregular soldier whether Pathan or Muslim roaming in the deserted streets of post-20 September 1857 Delhi city. The soldier on internal duty in interior of Sindh behaves in a manner remarkably similar to the British Indian Army soldier in 1940s during the Hur uprising. A judge of the highest court in Pakistan notes that there was uniform precedence and similarity in the behaviour and verdict of Supreme Court judges in dealing with petitions of dismissed Prime Ministers belonging to Sindh! The Pakistani Muslim judge of today is as much a loyalist to the status quo as his pre-1947 predecessors. Subconsciously Punjab loyalty of 1857 is the pattern to be followed even today. “Loyalty pays” is the unwritten law followed by judges, civil servants, army officers, journalists, etc.!! The British divided us into Hindu-Muslim or Sikh-Muslim or Punjabi Muslim-Hindustani Muslim or into Pathan- Punjabi or Afridi versus Turi or Pathan versus Baloch once they left in 1947. They divided us into Shia-Muslim when they used the Shia Turi tribesmen against Sunni tribesmen. The Britishers are very intelligent and brave people but their approach towards other nations is highly cynical and Machiavellian. 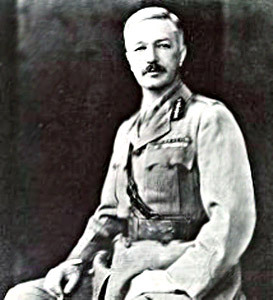 Brigadier General Dyer, the British Hero of Jallianwala was observing the following whose implications few Indian Muslims realised in 1918, Dyer thus stated”, it will be remembered that the Hazaras are Shias, hence their eagerness to blot out as many of the Sunni Sarhadis, per man as they could manage (577)”. 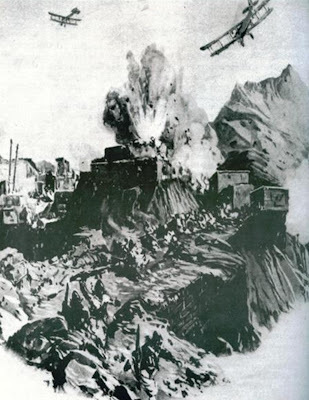 Dyer was writing about his employment of the Hazara Shias of Quetta against the Sunni, Iranian, Baloch, tribes of Iranian Baluchistan against whom the British Indian government had sent an expedition to Persian Baluchistan during the First World War. Brigadier General Dyer used Hazaras like this devastatingly against Iranian Baloch in 1915-16 just because they regarded Sunnis as non believers and vice versa ! The Americans who are richer materially but a little naive intellectually at least in their State Department realized the strength of Shia sect only in 1979!! It is instructive to note that the first major British administrative decision after 1857 was placing Delhi and the area under the government of Punjab. This was a deliberate administrative manoeuvre aimed at increasing the Hindustani- Punjabi divide. The Punjabis were told that this was punishment to people of Delhi and the Muslim Ranghars for having participated in the Sepoy Rebellion of 1857 and a reward to the people of Punjab for the Punjab loyalty in 1857! What actually happened was that the Muslim majority in Punjab was reduced because of this measure from some 61% to 57%578 and also forced a culturally different Ranghars Muslim community to travel all the way to Lahore for settlement of their matters relating to the provincial government and provincial high court in Lahore. The people of Delhi also had to travel all the way to Lahore from 1858 to 1911. The injustice done by this decision was remedied only once the present Indian State was created. The trouble started with the infantry but was contained with the successful disarming of the sepoy units in Calcutta and surrounding area. The significant move which led to the transformation of the series of mutiny into a full fledged political military rebellion aimed at ousting the English East India Company from India and achieving independence was, however, started by the cavalry. The role of cavalry as leaders can thus be seen :– a) The 3rd Light Cavalry’s rebellion at Meerut on 10 May 1857 and its lighting move to Delhi and the seizure of Delhi on 11 May 1857 was a coup de’tat and an outstanding example of initiative and courage. Had the Pakistani or Indian armour commanders possessed even 50% of this elan they would have been on the Amritsor Jallandhar Road bridge on the Beas River or in Gujranwala in case of the Indians in 1965 war! The British through some remarkable feat of military genetic engineering created a system which encouraged mediocre Indians to become officers! Perhaps even British generalship with few exceptions has always been mediocre! b) The decisive rebellion at Cawnpore was initiated and led by the 2nd light cavalry on 4th of June 1857. c) The rebellion at Sialkot was initiated and led by 9th Light Cavalry in July 1857. d) The 7th Light Cavalry played a leading role in the rebellion at Lucknow in June, 1857. e) The 1st Light Cavalry led to rebellion at Mhow and at Nimaeh in Central India and Rajputana. It must be noted that some 75% of the Bengal Regular Cavalry was Ranghar Muslim or Hindustani Muslim from the districts around Delhi. Thus the Muslims were the leaders in all the major rebellions whereas the bulk of infantry was Oudh, Hindu, Rajput or Brahman and these actively joined the predominantly Muslim cavalry in the rebellion. Concentration of predominantly Hindu infantry regiments at Delhi and Cawnpore illustrates that till 1857 the Hindus still regarded Muslims as the natural leaders. The role of artillery was crucial during the rebellion. The native artillery was a comparatively highly developed arm in 1857. It played a crucial role in the defence of Delhi and Lucknow. Two out of the total four horse troops of the Bengal Army artillery rebelled in 1857. Six out of the total 18 batteries of the Bengal Army also rebelled in 1857. Subedar Bakht Khan the famous sepoy leader was from Horse artillery and had served in the First Afghan War and in the Sikh Wars. The post-1857 reorganisation of the Indian Army resulted in abolition of native artillery on security grounds. Thus after 1857 the only Indian artillery retained were few insignificant mountain batteries. G.G.O. of 1861 dearly laid down that: “resolved henceforward with few exceptions as may be rendered necessary by local considerations, there shall be no Native Artillery” (579). Most of the infantry regiments of the Bengal Army also joined the rebellion. Just 11 of the 73 Regular Infantry Regiments of the Bengal Army survived the rebellion (580). Sikh artillery played havoc with British at Chillianwallah in January 1849. In Pakistan this rebellion has by and large been largely ignored. Unlike India in 1857 no centenary celebrations took place in Pakistan. No governmental effort of any significance was made in Pakistan to study the rebellion. The reasons are obvious. 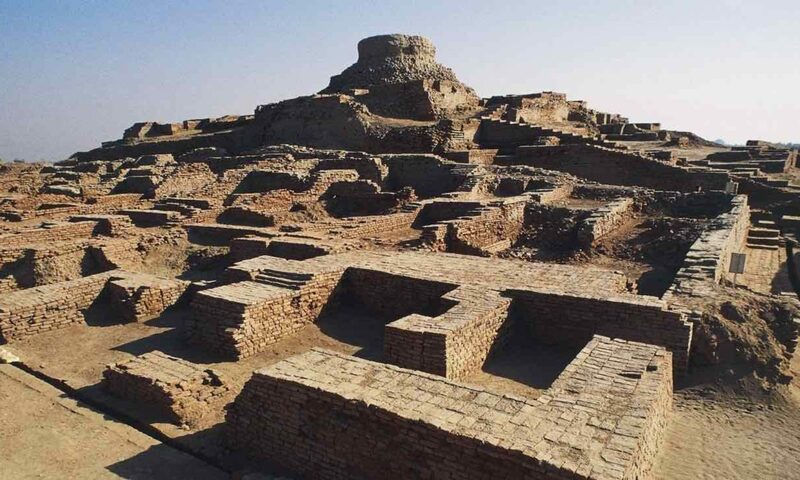 The areas which comprised Pakistan both East and West were loyal to the British and actually Punjab and Frontier played a decisive role in providing cannon fodder to the British in suppressing the rebellion. Why this happened has been discussed under the heading “Punjab Loyalty”. Tribes of the Ravi especially the Kharrals and Fatianas did actually actively participate in the rebellion which was very creditable, keeping in view the fact that they had no representation in the EEIC army unlike the Hindustanis or the Punjabi Mussulman and Pathan soldiers of the North of Chenab river region. But the Kharrals and Abbasis were two glorious but isolated exceptions in Punjab. The grandfather of Liaqat Ali Khan, the first Prime Minister of Pakistan played an active role in protecting the British line of communication in the Karnal area. Ancestors of Malik Feroze Noon another Prime Minister of Pakistan rendered active service in assisting the EEIC forces during the siege of Delhi. The ancestors of Sir Sikandar Hayat and Sardar Shaukat Hayat two prominent Punjabi Muslim leaders were actively represented at the British camp opposite Delhi. Sikander Hayat’s grandfather was junior native aide de camp with the indomitable Nicholson. Sir Syed Ahmad Khan the leader of UP Muslims in particular and Indian Muslims in general in the post-1857 period rendered active service in loyally assisting the British cause in Bijnor in 1857. The Nawabs of Rampur, Bhopal, Hyderabad, Loharu, Pataudi etc. were all loyal and staunch to the British cause during 1857. The Nawab of Loharu actually told Blunt an Englishman who visited India during the Viceroyalty of Lord Ripon that “What he did not like about the mutiny was that most of them were Hindus” (581)! This is funny coming from a man whose ancestors served Hindu rulers. Those who do not know the background of this Mickey Mouse little state will be surprised to know that its founders owed their rise to loyal service under the Hindu Mahrattas. Subsequently these men transferred their allegiance to another Hindu i.e. Raja of Alwar (582)! The rebellion thus was largely ignored in Pakistan. Lip service was paid in history text books but only a limited attention was devoted to the event. In the late 1980s and 1990s another tendency has surfaced. Many intellectuals have actually openly declared the Punjab loyalty to the British as correct and have devoted a considerable energy in vilifying and criticising the Hindustani Muslims as villains of 1857. Manzoor Ahmad Manzoor has written a book titled “The Pakistan Problem — Historical Backwardness of Punjab and Consolidation of Pakistan” published in 1993 by Frontier Post Publications Lahore. Manzoor Ahmad Manzoor has vehemently defended Punjab loyalty in this book. This is understandable and justified and as we have seen in the analysis of the “Punjab Loyalty Aspect”, there were reasons why Punjab remained loyal. Every action in history of a region has a background. Unfortunately Manzoor Ahmad Manzoor has avoided discussing the Sikh movement in greater detail. A dispassionate analysis of Punjab history convincingly proves that the most redeeming and reassuring part of Punjab history was the Sikh Guerrilla war against the Mughals and Afghans and the subsequent establishment of Punjab as a strong state by Ranjit Singh. Manzoor Ahmad Manzoor, however, in his hostility to Hindustani Muslims has lost sight of that scholarly balance which may have been the hallmark of his otherwise reasonable work of reinterpretation of modern Punjab history. He has, however, failed to offer a viable solution to the fact that centrifugal tendencies are on the rise in Pakistan. The other provinces of Pakistan are not viewing Punjab in as positive a light as they should have merely because of the fact that the province has failed to provide a leadership which is commensurate with the political representation, resources and potential of the province. A historian has to be forthright and even blunt but sheer ethnic hostility degrades a historical work to the level of a propaganda leaflet! How can historians remain historians when they start criticising Liaqat Ali Khan just because he was a Hindustani Muslim? The man may be criticised for being indecisive and incompetent in constitution making or in being a sycophant but to criticise him using labels like Urdas and Urdu vis reduce a historian’s level to that of a commercial writer who merely wants to sell his books to one particular province. Similarly Hindustani Muslims spend considerable energy in slightly deflating Iqbal’s role. The major problem of today’s Pakistan is lack of mutual understanding. The different ethnic regions must learn to respect and understand each other rather than despising each other. In this regard Manzoor’s opinion about the Hindustani Mussulmans who constitute some 20 to 25% of the population is extremely adverse. The Hindustani Muslims also suffer from an unfounded superiority complex which does not endear them to any of Pakistan’s other four nationalities. On the other hand the Punjabis have to get rid of the “Martial Races superiority complex”. The army has to be made more broad based so that its soldiers are not trigger happy in any region whether it is Karachi, Baluchistan or Northern Area. The politician must become responsible and adventurism in intelligence agencies which has destroyed the country’s foreign policy as well as internal political stability must be curbed. The Urdu speaking people should remember that a century ago UP was as afraid of open competitive examinations as the comparatively backward provinces of Pakistan. 100 years ago no one in India could compete with the Hindu Bengalis in competitive examinations! If the Urdu speaking populace of UP has a higher literacy level than other people it is merely because the EEIC annexed their area long before Sikh Punjab or Talpur Sind! The Punjabis also must remember that 150 years ago a mere 10% Sikhs ruled them and they became a so-called martial race only after 1857! A very deliberate effort is required to frame a sound policy to interpret the country’s history on rational lines. At the moment history is the most distorted and abused subject in the country’s educational institutions. The 25 years of military rule have played a very negative part in this regard. A serious and devoted response is required to correct this deplorable state of affairs. In the first years of independence two groups of ICS officers started this process by giving all the credit to Aligarh or Lahore! Only one out of seven rebels of 1857 was a Muslim whether a Ranghar from Delhi Division or an east of Jamna Hindustani Muslim. Some four to five out of ten natives fighting for the British against the rebels were Muslims, either Punjabi or Pathan. This demolishes the connection that anyone in Pakistan may like to imagine between the rebellion and the “Two Nation Theory” or with the majority of races or ethnic groups in today’s Pakistan with the whole affair! The leadership of the rebellion thanks to the Light Cavalry regiments who took the lead in all major outbreaks at Meerut, Mhow, Sialkot, Cawnpore Lucknow, Jallandhar, Jhansi Neemuch was no doubt Muslim but only Hindustani Muslim or Ranghars from Delhi territory who do not even today identify themselves in any way with Punjabi Muslims. The same Ranghars who were a thorn in the eye of many politicians in 1947-48 since they were changing the constituency composition of many feudals in rural Punjab or Sindh! Whose camps in Sahiwal district were fired upon so as to discourage them from settling in as compact a way as they wanted. his history of Pakistan army committed this gross factual error. What happened in the first world war to 5th Bengal Native Infantry, then known as 5th Light Infantry stationed at Singapore! The Regiment having four companies of Hindustani Muslims and four companies of Ranghar Muslims mutinied on 15th February 1915, killed their officers and were masters of Singapore for three days till their mutiny was crushed on 18 February 1915 (591)! After First World War they stopped trusting not only Muslims but all communities in India. c. In the cavalry they had all Muslim regiments like the skinners Horse (All Hindustani) and 15 Lancers till 1919. There is too much talk of Khilafat Movement in today’s Pakistan. The fact that Iqbal the philosopher of the Nation was more interested in Knighthood than the Turks is conveniently ignored. The fact that the 85 percent Indian Army units were involved in fighting against the Muslim Turk negates the theory that there was much of sympathy for the Muslim Turks in the Punjabi Muslim troops at least, who constituted some 75% of all Muslim troops fighting against the Turks. The only major rebellion/resistance against fighting the Turks was witnessed in the following cases:- a. The 15th Lancers composed of Dera Ismail Khan Pathans in Mesopotamia. c. The Ranghar Muslims of 5th Light Infantry who mutinied because they mistakenly thought that they were marked to be despatched to Mesopotamia or Egypt to fight against the Turks. d. Jemadar Mir Mast Afridi the indomitable Tirah Afridi who so much sympathised with the Turks that he defeated the Germans in France with 14 other Afridi Pathans on the night of 3rd /4th March 1915 and came all the way back to Tirah to fight against the British 593.
e. Not a single Unionist leader who joined the Muslim League in 1946 participated in the 1919 agitation against the British in Punjab which was largely a Sikh or Punjabi Hindu dominated show. Amritser and not Lahore was the leader in the 1919 agitation! Many Afridi Pathans deserted from the 40th Pathans to the German lines in France and East Africa (594). rights are Indian agents! Human rights activists are Jewish agents! Anyone who questions the ruling Junta or the army or its quixotic intelligence agencies is a “terrorist”! The patriots are only in certain Martial Doabs and nowhere else! In the favoured Doabs also only obscurantists believing in certain medieval theories are in favour. The rest is fiction, a RAW agent or a Zionist agent etc. etc. a) Havelock’s campaign from date of leaving Allahabad to the first relief of Lucknow in September 1857.
b) Outram’s subsequent defence of Lucknow Residency enlarged position from September 1857 till relieved by Sir Colin Campbell in November 1857.
c) Sir Colin Campbell’s relief of Lucknow in November 1857.
d) Outram’s defence of Alambagh position South of Lucknow city from November 1857 to March 1858.
e) Windham’s defence of Cawnpore. f) The complete Central India Campaign of Sir Hugh rose. g) The siege and final capture of Lucknow by Sir Colin Campbell in March 1858.
h) Whitlock’s campaign from first to last in Central India. 24. British. According to Michael Edwardes during the actual fighting some 2034 white officers and men were killed, but no fewer than 8,987 died because of heat stroke cholera etc.611. 563 Roberts while describing the battles of the Second Afghan War in his book Forty One year in India made many references to the fighting qualities of various races in India dubbing the Bombay Army as one which could not be composed of the best fighting races of India (Pages-24 to 98-Forty One Years in India-Volume II-Op Cit). Under Roberts tenure as C-in-C the class composition of Indian Army was changed from largely Hindustani Hindu to Punjabi Muslim Sikh Dogra and Pathan (Page-346-Philip Mason-Op cit). As per Roberts the races from Punjab were more martial than all other races of India. Thus the Madras Army was for all purpose reduced to a Punjabised Army with very few Madrasis from 1885 onwards when Roberts became C-in-C Bengal Army and thus C-in-C India. Similarly the recruitment of Marathas from Bombay was also severely reduced (Pages-346, 347 & 348-Philip Mason-Op Cit). Why doesn’t anybody ever mention that majority of the rebels against the British were the Gujjar race and from the imperial ghazette, the Gujjars whether Hindu or not were the worst enemies of the British in the whole land. They were literally scared to go to Kairana of today and even till this day, its a highly militarized and criminal zone. They were classified as a criminal race. Real warriors do not care about labels others give them. Real warriors fight every race regardless whoever they are.